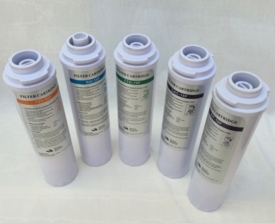 This filter set includes five replacement filters for the HiQ Reverse Osmosis System (ROQ5-50F). 1st Stage: 5-micron Sediment Filter PP-10F (replace every 12 months). This filter removes sand, silt, clay and dirt, protecting and increasing the service life of the remaining filters. 2nd Stage: Granular Activated Carbon Filter GAC-10F (replace every 12 months); takes out most of the chlorine and reduces taste and odors and removes organic matter. 3rd Stage: 10-micron Carbon Block Filter CTO-10F, disposable (replace every 12 months). This carbon block filter is made of high quality activated carbon. It reduces chlorine taste and odors and it conditions the water before being treated by the reverse osmosis membrane. 4th Stage: 50 GPD TFC RO Membrane Element RO-10F. This membrane filter removes contaminants and up to 96% of dissolved solids. To get the 4-filter kit WITHOUT Membrane, , click here. 5th Stage T33 10 micron Post Carbon Polishing Filter T33-10F (replace every 12 months); provides final polishing of water after the storage tank. All five filters are changed once a year.